“It is painful to discover with what concern they speak of war and threaten it. They do not know its horrors. I have seen enough of it to make me look upon it as the sum of all evils. Should the step be taken which is no threatened, we shall have no alternative; we must fight. Jackson’s reasons for wanting to get into Magruder’s battery in Mexico. McCabe, James Dabney, The Life of Thomas J. Jackson by an Ex-cadet. Jackson shouting instructions to the men at First Manassas. Jackson in a conversation with Maj John Harmon . “always mystify, mislead, and surprise the enemy, if possible; and when you strike and overcome him, never let up the pursuit so long as your men have strength to follow; for an army routed, if hotly pursued, becomes panic-stricken, and can then be destroyed by half their number. The other rule is, never fight against heavy odds, if by any possible maneuvering you can hurl your own force on only a part, and that the weakest part of your enemy and crush it. Such tactics will win every time, and a small army may thus destroy a large one in detail, and repeated victory will make it invincible. Jackson to Maxcy Gregg when Gregg halted his men. Prelude to arrest of A.P. Hill From Benson, Berry Benson. Jackson in a letter to his wife initially hoping for a son made this statement. Jackson to Longstreet when asked if he was scared of the massing Yankees in front of the positions outside of Fredericksburg. Bee acting to rally his troops at Bull Run utters this statement. Soldier catches a glimpse of Jackson aboard a train heading to Richmond to confer with Lee. Diary, Henry A. Chambers. one of Jackson’s men writing about him after the war. Eggleston, George Gary Rebel’s Recollections, p132. Ewell talking to Munford after the Port Republic battle. Garnett to Pendleton and Douglas at Jackson’s funeral bier in Richmond. Garnett was invited to be one of the Pallbearers and gratefully accepted. “I have now seen a good deal of “Stonewall Jackson” and my impressions of him do not differ from what I expected-great energy & will – without much system – capable of any amount of endurance, he is rather indifferent to the comfort of his troops, & they are broken down very fast. He is very silent & mysterious. The greatest excitement I have ever seen him show was exhibited when we passed a fine country house & ladies waved handkerchiefs and cheered. He turned to me & said “no man demonstrating can so affect me as the cheering of the women of our country in the midst of so many trials” we were then sitting together in the cars, :& he had been very quiet. He does not look like a great man. 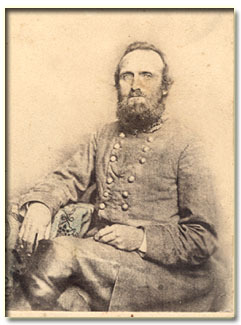 Munford talking about Jackson’s belief in controlling the cavalry in his command. “Stonewall rode up to have a word with Lee. As he dismounted, we broke into astonished smiles. He was in a spick and span new overcoat, new uniform with rank marks, fine black felt hat, and a handsome sword. We had never seen the like before, and gave him our congratulations on his really fine appearance. He said he “believed it was some of his friend Stuart’s doings””. Taliaferro remarking on his ignorance of Jackson’s plans and dispositions. “measured other men by his own standard and required them to come to his own ideas of duty to be performed. “they were such quiet neighbors I scarcely knew they were there”.